There are a lot of myths about the kind of diet a new mother should have. And these myths are being preached since ages. Let's debunk a few of those myths! 1. The lactating mother should drink extra water, so that the baby will get it through breastfeeding. Fact: The new mother need not drink extra water; the breast milk provides sufficient hydration to the baby by itself. 2. The new mum should not eat anything which is gas forming, as the baby will have that problem too. Fact: How can the baby have flatulence if the mum eats anything! This theory does not have a scientific base. 3. A well balanced and nutritious diet is needed only till she delivers the baby. Fact: A lactating women also needs a nutritious diet. She does not need to eat for two, but should eat properly, and should not neglect her health. 4. 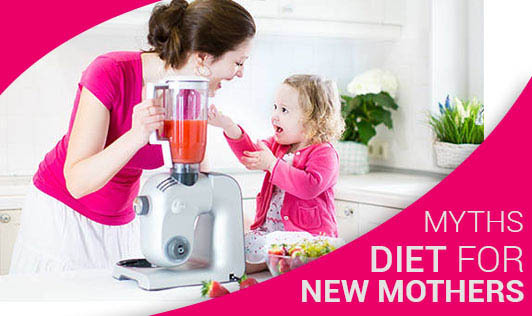 A new mum can immediately start a weight loss diet to get back in shape. Fact: Most females are desperate to get back in shape soon after their delivery. A lactating woman should not bother to lose weight till her baby is at least 4 months old. Breastfeeding properly is the best way to lose weight healthily till that time. 5. A new mum should not eat spices, as it affects the nature of breast milk. Fact: Adding little spices in your food will only give you a good taste, and won't affect the breast milk at all. Enjoy the food as per your taste!